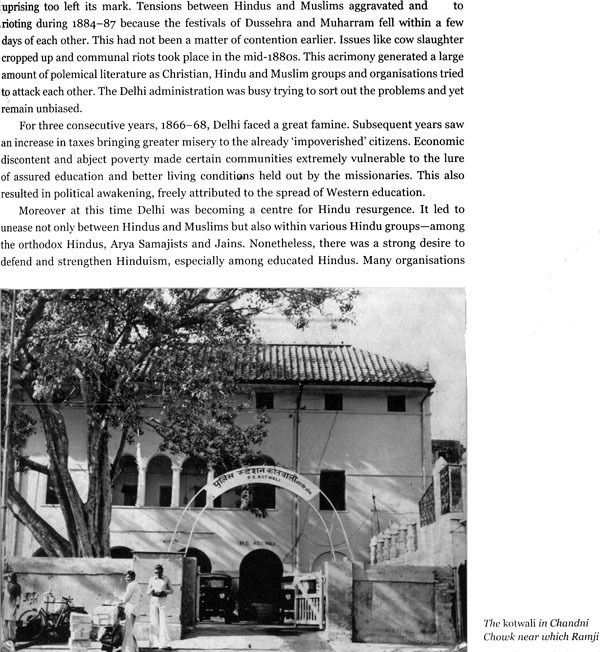 Hindu College Delhi: A People's Movement is the first-ever illustrated history of Hindu College, Delhi, a premier institution founded in 1899. The continued struggle for doing well and survival only underlines the great commitment of its founding fathers, the teachers and the students in the early years. The college had to face several odds and a hostile administration, which feared the patriotic fervour of the college, providing a hub for the national leaders to address the youth of the country. The college groomed great nationalists ready to take on the British regime. This hostility made the college authorities more resolute to succeed. 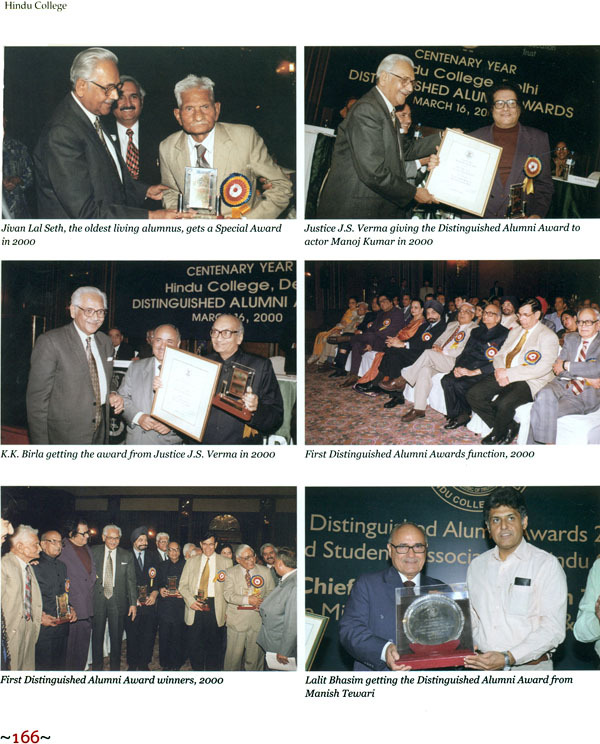 It is no wonder that the college has produced some of the most illustrious alumni who have contributed to different fields resulting in the overall progress of our country. The essence of more than three years of relentless pursuit of authentic material from individuals, libraries, archives and location visits has been finally distilled in the form of this book. Extensive research led to the discovery of archival documents, invaluable photographs and miscellaneous unknown facts about the college that were hidden in the labyrinths of time. Much of these have been presented in this book and is bound to appeal to both the older and present generation of people who are linked in some way to the prestigious Hindu College. Dr. Kavita A. Sharma, the first lady principal of Hindu College, Delhi and currently director of India International Centre, New Delhi, has taught for thirty-seven years in India and abroad including Hindu College, Tokyo Women's Christian College and Universities Indonesia. Her involvement in education is seen in her books like Sixty Years of the University Grants Commission and Internationalization of Higher Education. A Fulbright scholar, she has been awarded numerous fellowships. She has several published research articles and books. She was conferred the Indira Gandhi Sadbhavana Award by the National Integration and Economic Council in 2005. Needless to restate the obvious that 1857 brought about unprecedented changes, of course, at the political level as also socio-cultural. More specifically, in the educational field the Minute of Thomas Babington Macaulay (1835) had succeeded in laying the foundations of a new system of education which we recognise as the 'modern system of education'. It is also relevant to make a mention of the Dispatch of Charles Wood (1854) which stated 'by not giving recognition to the indigenous systems and institutions, we will succeed in shrivelling up the system and it will shed of its own accord without our being held responsible'. The indigenous systems of education and the institutions were certainly beginning to shrink and shrivel for lack of not only financial support but also diffidence in the efficacy of those systems. The establishment of the Presidency College in Kolkata (established as Hindu College in 1817 and renamed Presidency College in 1855), the Presidency College in Madras (established as Madras preparatory school in 1840, later upgraded as a college and affiliated to Madras University in 1857) and of the University of Bombay in 1857, was a consequence of the acceptance of an institutional system advocated by the 'Anglicans'. Delhi was neither Calcutta nor Bombay nor Madras. Prima facie Delhi did not have a vibrant tradition of 'oriental' learning. Of course, there were centres of Sanskrit, Prakrit, Arabic and Persian learning. The initiative of establishing institutions in accordance with the new policy of education was with the missionaries. This is obvious from the founding of the St. Stephen's College in 1881. In contrast was the jerky and turbulent history of the Anglo-Arabic College established in 1792 (later known as Delhi College, taken over by the government, but closed down by the Punjab University in 1877). The history of the establishment of the Hindu College (1899) has to be situated against the backdrop of these developments. The result of the tireless efforts of two alumni, Dr Kavita A. Sharma, the first woman principal of the Hindu College (1998-2008) and W.D. Mathur (Bobby), former bureau chief of The Indian Express, in tracing the history of the establishment of the Hindu College are as welcome as revealing. 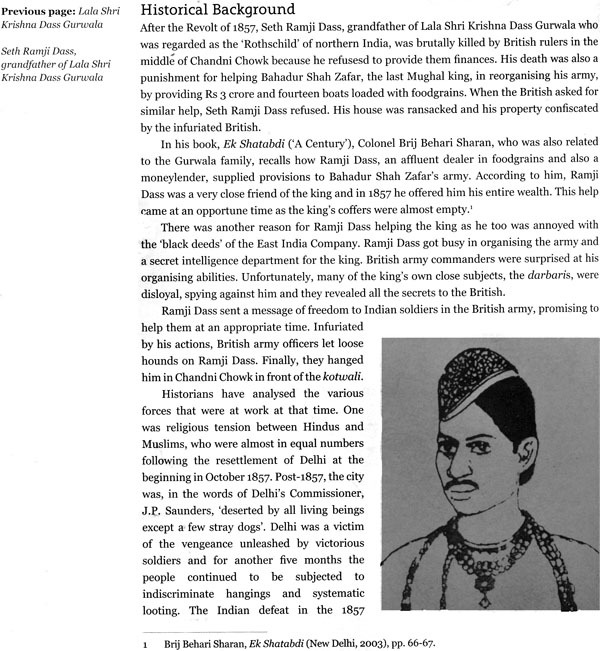 They have dug up material lying in a variety of sources-ranging from National Archives, Delhi Archives, Teen Murti House Library, Hardayal (Harding) Library, Marwari Library and Delhi Public Library as also minutes of the Executive Council of the Delhi University from 1922 and other private sources. All this must have been a very difficult task demanding tenacity, conviction and dedication. Their findings uncover the urges and motivations of members of the civil society (even if they appeared to be 'loyalists') in establishing an educational institution which would be instilled with a commitment to nationalism and yet follow the systems of education that were now in place. Their effort is comparable to Sherlock Holmes in piecing together rare evidence to trace the journey of the college. Their research identifies the commitment of a few residents in Old Delhi, such as late Lala Shri Krishna Dass Gurwala, Lala Sultan Singh and others to start an institution, find funds and a location. Their narration of housing the college in a small residence in Kinari Bazaar, Chandni Chowk, the inauguration ceremony performed by Pandit Madan Mohan Malaviya in a dharamshala in Chehlpuri on Basant Panchami, the financial support, the shifting of the college to Kashmere Gate in 1908, are as fascinating as educative. Among the first thirteen students was Sir Shri Ram, who was there for a brief of period of six months before he left to join his family business; he was later to become the chairman of the college Governing Body. His whole family has been dedicated to this college as is obvious from the fact that his son, Lala Bharat Ram, was also later to become chairman of its Governing Body. The shifting of the college to Kashmere Gate was a milestone. Now, for decades the Hindu College has become a vibrant centre of learning, scholarship and more, with a distinct personality characterised by a commitment to nationalism. It provided a space for free and frank dialogues at many levels, between the faculty and the students and between and amongst students, of different disciplines. 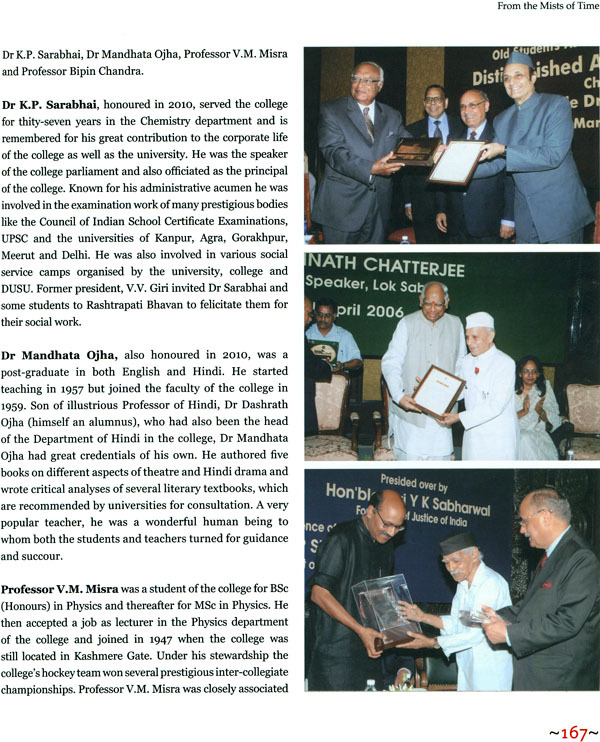 Just as important is the fact that the students of this college did not aspire for government service, although it is this college which produced a Khub Chand, one of the early members of the ICS. By and large the students explored many avenues, be it business, as in the case of a K.K. Birla, not to speak of a Sarup Singh, who rose to be a vice chancellor and governor, and of course the educationist B.M. Bhatia. The Hindu College nurtured diverse faculties of this young generation of the 1930S and 1940S. It resulted, in part and whole, for the flowering of those who have played an important role in shaping modern India. Just a few names may be mentioned from amongst the faculty as also the students: Dr Inder Sen, Professor of Philosophy (who later left to join the Aurobindo Ashram in Pondicherry), Dr S.K. Saxena (who was later a distinguished professor in University of Hawaii), Daya Krishna, Raj Krishna, Giri Lal Jain and L.C. Jain. The training ground was the parliament of the Hindu College, where, beyond the conventional curricula, there was opportunity for debating and being nurtured to perhaps a life in the larger sphere of nation-building. The authors mention these and also give a very vivid account of the contribution of successive principals, particularly N.V. Thadani. Those of us who have also been students of the Hindu College will read this book with a sense of nostalgia and pride and others, especially the younger generation, it is my hope, will read it as revealing the initiatives and an unflinching commitment of the members of the civil society, long before the term NGO was coined. From adventure to endless amazing revelations! From sheer exasperation to elation! It was a long journey leading us to the culmination of this book, Hindu College Delhi: A People's Movement; but only the first step has been taken. We realised that there was no book on Hindu College and that the circumstances of its establishment and evolution would gradually fade away from most people's minds, both students and teachers. It was always intriguing what led so many rich and powerful businessmen who were Rai Bahadurs and Rai Sahibs to establish a nationalist college in 1899 when on the face of it, it would have been hazardous for them to do so; and what made so many influential people from all over the country come together and join the enterprise. An RTI response revealed that the college started as a Joint Stock Company and the records of the Registrar's office provided the names of the Board of Trustees over the years together with the earliest Memorandum of Association that was filed. Punjab Gazetteers Vol. V A published at the beginning of 1910 observed, 'This college was established in May 1899 for the purpose of giving cheap but efficient secular education with sound religious instruction, according to the principle of Sanatana Dharm .... In addition to the subjects prescribed by the University, all Hindu students are required to attend a religious class once a day.' The college was affiliated to the Punjab University. A society by the name of Hindu College Delhi was registered to establish the college in 1899 with the objective of giving sound education in English up to the highest university standards. 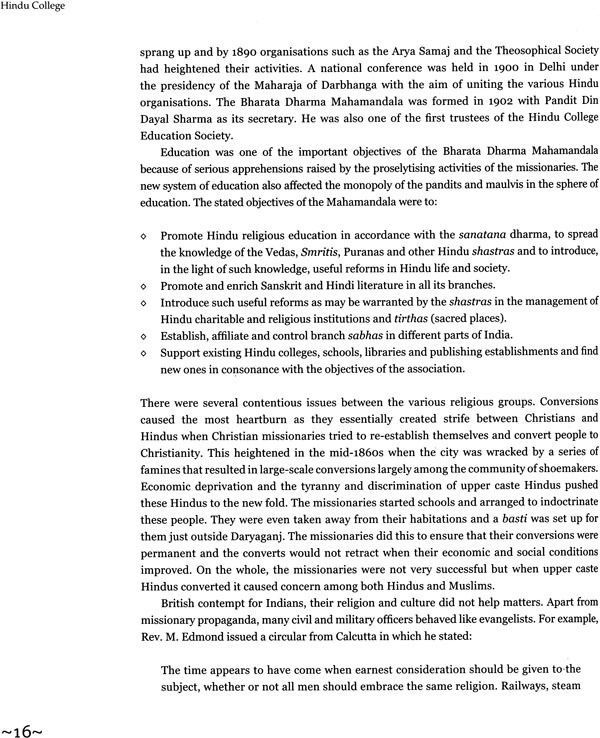 In the case of Hindus, the aim was also to combine secular education with thorough religious instruction according to the teachings of the santana dharma, on non-sectarian principles. Muslims were not prevented from joining and those who did, were not compelled to study the Hindu texts. Thus, religious instruction was a part of the agenda; the vision, however, was neither bigoted nor parochial and narrow-minded. Secularism and voluntary religious instruction were not seen as incompatible. Of course with the coming of Independence, the idea of what was secularism changed and so the clauses pertaining to religious instruction in the Memorandum of Association had to be modified. As we got into this project, we realised that the information was coming; even though at a snail's pace. And then we hit the jackpot. 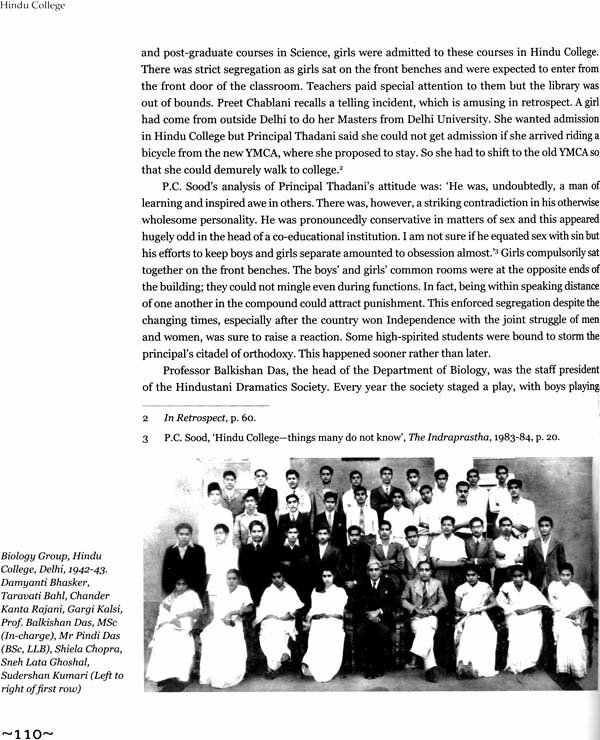 We discovered that the college magazine The Indraprastha, the issues of which were there in the library right from 1930S, were a wealth of information, providing not only the missing links but also confirmation of certain events that were restricted to hearsay. These magazines also gave us a glimpse of the character of the institution, the commitment of teachers and the maturity and devotion of the students. But what was it that gave the college a nationalist character and a patriotic fervour? What was the root? The sad part is that the magazine during the decade of 1940S, the crucial time of the Quit India Movement, was missing. We do not know whether they had been published or had just got lost. Serious apprehensions were being raised by the proselytising activities of the missionaries, especially in the mid-i Soos when the city was wracked by a series of famines rendering the poor backward families vulnerable to conversions in lieu of material help from the missionaries. The fear was that the missionary educational institutions would be used for indoctrination. The only existing college-the Anglo-Arabic College (later Delhi College) established in 1792, was taken over by the government in 1824. This only added to these apprehensions and created a vacuum of indigenous higher education in Delhi. The aim of the takeover was to transform it into a British institution of education and to make it a centre of new ideas. Following public outrage, attempts were made to revive it between 1871 and 1879 but in vain. The Punjab government closed it down because of poor enrolment depriving the city of the only Indian institution. The establishment of the Mission College (St. Stephen's) in 1881 was resented because it placed higher education solely in the hands of Christian missionaries. When Hindu College was founded, this clearly formed the backdrop of the circumstances and little wonder that it was the breeding ground for anti- British feelings manifest in subsequent years. Coming up from the humblest beginnings, continuously facing financial constraints and resistance from the pre-Independence administrators, this college rose to become a giant, providing a forum and a base for our national leaders to address the youth of the country during the freedom struggle. Their visits were a great inspiration for the staff and the students. It was natural for them to get involved in the freedom movement. The college was born as a part of the nationalist impulse. Several visits to the National Archives and the Delhi Archives provided us invaluable documents-police records of the Quit India period and the participation of Hindu College students. 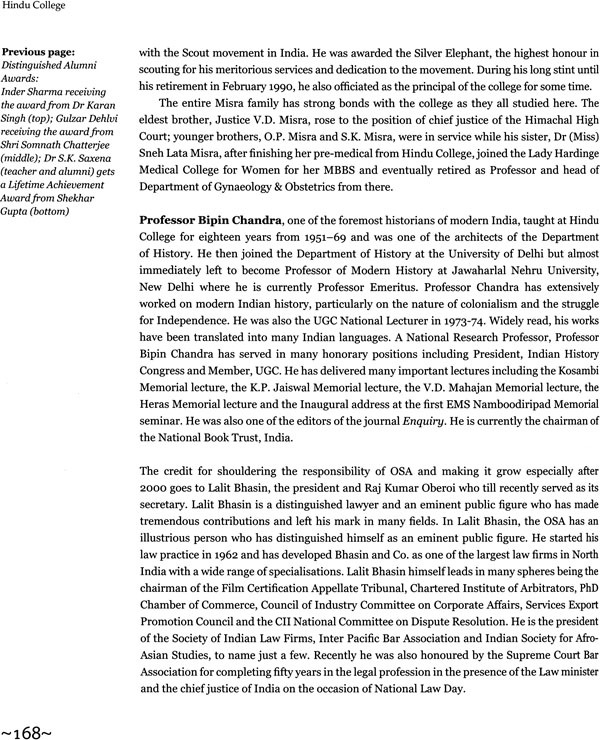 Visits to Delhi University led to the perusal of the Executive Council Minutes from 1922 (the year of the establishment of Delhi University) to the present. These gave an understanding of the role played by the three constituent colleges-Hindu, Ramjas and Stephen's-to ensure that the university stabilised and grew. Also they reflected the travails of growth especially of Hindu College which had a commitment to not turn any student from its doors in spite of its meagre resources. Apart from the college magazine The Indraprastha, we mined material from the yearly directory of Hinduites brought out by Raj Kumar Oberoi which contained invaluable articles written by Hinduites; the little booklet brought out at the Diamond Jubilee celebrations; In Retrospect, a book of reminiscences of Hinduites published during the Centenary celebrations, together with the articles in the souvenir published on that occasion. There were oral histories we conducted and made innumerable telephone calls and trips to libraries-Teen Murti House, Hardayal (Harding) Library, Marwari Library, Delhi Public Library and Central Secretariat Library. The access to them and work there was facilitated by Dr Majumdar, Chief Librarian, India International Centre. Then there were visits to people's homes, pursuing them to part with photographs and any material that they might have. Incidentally this fulfils the ambition of our former chairman of the Governing Body, Dr Bharat Ram, whose long association with the college as chairman, for four decades, can easily explain his great love for the college. 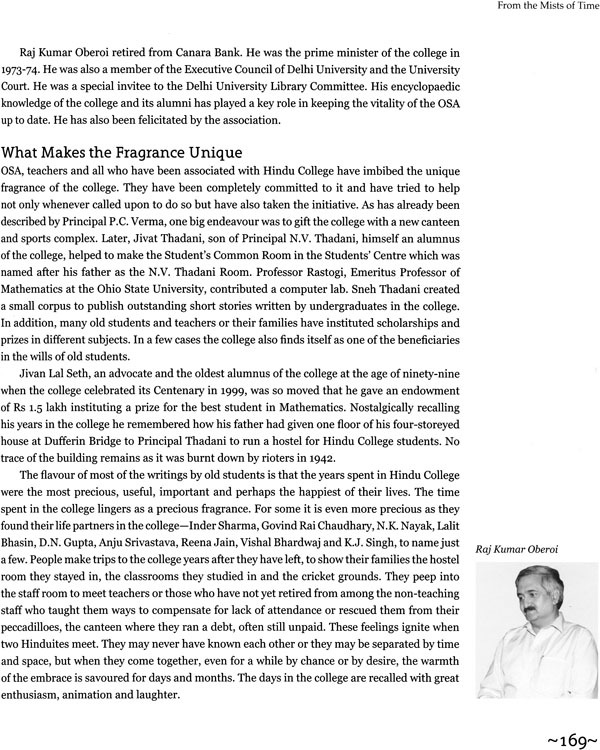 While speaking at the College Founder's Day function way back in 1974, he said, 'I would like to suggest to Dr Bhatia (Principal) that he should commission some knowledgeable person to write the history of the college which is seventy-five years old.' While we could not say anything about this knowledgeable person, it took almost four decades before we could gather the courage to take up this stupendous work. There were times when we reached a dead end either because of non-availability of century-old records or complete ignorance or lack of interest on the part of the people who belonged to the families of those who had given the nation this great institution. We started talking about the futility of taking up this work of digging into the history of this college right from its inception. Yet we kept encouraging each other and managed to convince ourselves that there was a chance and there was no need to lose hope. We know that a lot more could be written and discovered about this great institution and we leave it to the future generations and interested historians to fill in the gaps and come out with more revelations.